The initial determination of the 'iddah period is very important to determine whether or not the couple should reconcile or to determine when a woman may marry someone else. Problems arise when there are different provisions in the Ministry of Religion Circular Letter No. 13.2 / 1 / Pw.001 / 1097/2004 with the views of the head of KUA Gayungan which is the executor of the circular letter. According to the circular letter, the period for talak divorce and gugat divorce starts from the date of issuance of the divorce certificate by the Religious Court which states that the `iddah period of the woman is calculated from the date the decision/determination has permanent legal force, namely the date stated above on the divorce certificate. While the Head of KUA Gayungan revealed that the `iddah period had fallen according to the date of the verdict. The disagreement between the circular letter issued by the Ministry of Religion and the head of KUA was examined using interview and documentation techniques and analyzed by descriptive analysis. 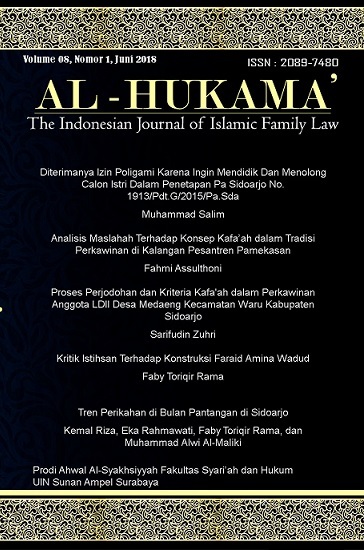 The results of the study state that the views of the head of the KUA in determining the beginning of the `iddah period are not contrary to the laws that apply in Indonesia. The Head of KUA gives more benefit to women, if the initial determination of the `iddah period 'using the circular letter of the Ministry of Religion in the East Java region, it is feared the beginning of the period' is longer than the date the decision has permanent legal force, because sometimes the parties take or arrange divorce certificates when they need the divorce certificate.